Behind George were enemies; in front, a raging ice-packed river. Poling across had seemed his best chance, but now large blocks of ice slammed into his makeshift raft, twisting it off course. Just as George dug his pole in and pushed with all his might, a block of ice hit the raft--the raft slammed into the pole--and George was overboard. 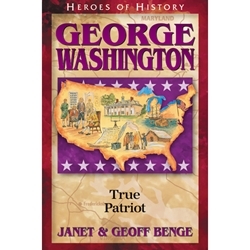 On a dangerous mission for the British army, young Major Washington had no idea that one day he would lead an army of fellow colonials in a bitter battle for independence against Great Britain herself, the most powerful empire in the world. In each new crisis, the young United States sought out George Washington. As commander in chief of the Continental army, chairman of the Constitutional Convention, and first president, this indispensable American served the struggling nation when its survival and form hung in the balance (1732-1799).